"I was afraid to receive this nomination, but I did it in the spirit of obedience to Our Lord and in the total confidence in his mother, the most holy Madonna." The official name of the Vatican, or Vatican City as it is inter-changeably called, is Lo Stato de la Citta del Vaticano (State of the Vatican City). It is not a country, but rather an independent city-state and is the smallest state in the world. It is roughly triangle-shaped and covers an area of 0.44 sq km(0.11 sq mi), lying entirely within the city of Rome, Italy, near the west bank of the Tiber River and west of the Castel Sant'Angelo. To the west and south it is bounded by the Leonine Wall. The Vatican is famous for its gardens which contain fine collections of orchids and exotic flora. The population of the Vatican was estimated at 900 in 2002. Until 2002 the Vatican unit of currency was the Vatican lira (plural- lire ) which is interchangeable with the Italian lira; when the euro began to circulate in January 2002 in the countries of the European Union, the Vatican accepted it as well. Italian is the official language of the Vatican; however, Latin is the official language of the Holy See (the seat of jurisdiction of the pope as spiritual leader) and is used for most formal papal acts and addresses. 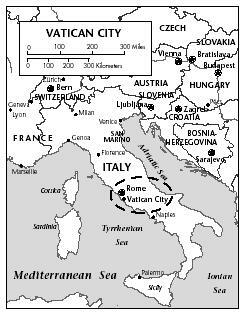 Although the citizens within the Vatican represent countries from all over the world, most of the inhabitants of the Vatican are Italian. The entrances to Vatican City are guarded by Swiss Papal Guards. Vatican City is the center of the Roman Catholic Church and the seat of its holy leader, the pope. The Vatican economy is supported by contributions, known within the Catholic Church as Peter's pence, and tourism. The only industries of the Vatican produce a limited amount of mosaics, religious publications, and staff uniforms. The Vatican is active worldwide in banking and financial activities. Other than postage stamps, the Vatican produces no exports. I am a great admirer of His Holiness Pope Benedict XVI, and so do my fellow Malaysiana and students in the Nothern State of Kedah, Malaysia.. With regards and best wishes from all of us in Malaysia. The good ties between Malaysia and Rome is a blessing for both nations and the people, in the present and the future. The establishment of cordial and diplomatic ties may enable both nations to share their 'peace and harmony' messages across the world; a blessing for us and the peoples of the world. God Willing, I believe that Malaysia and Rome are a good example of 'The Most Tolerant and Peace-loving Nations'. May God bless Malaysia and Rome!